Vegetable preserves | Infonet Biovision Home. Vegetables can be preserved in several ways. This is quite a simple process where upon submerging the filled jars in boiling water, any air spaces within the jars will expand releasing the air through the water and causing a vacuum between the lid surface and the product within the jar. Temperatures reached will kill bacteria and result in a sterile environment until the jar is opened. Make sure all jars and lids have been cleaned in hot water to remove any debris from within. Fill jars with contents (jams, preserves etc) whilst they are still hot leaving 1cm of space between content surface and lid. Filling whilst contents are still hot will minimise the time needed for pasteurisation. Gently submerge the jars into a saucepan or sufuria (cooking pot) of hot water and quickly bring it to a gentle boil. Remove the jars after 15 min. and leave to cool before storing. CAUTION !! Try to make sure the jars fit fairly tightly in the saucepan otherwise they will jump about and may easily crack. 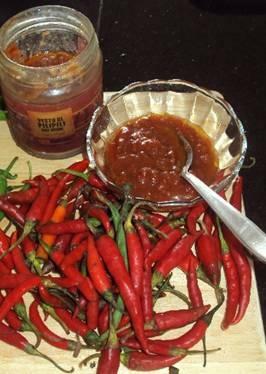 Be sure not to burn your hands in the hot water or against the hot jars - use a wooden spoon and cloth or jar holding tool to guard against this. 1. 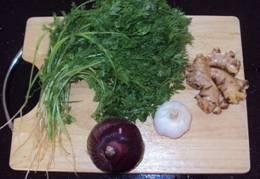 Wash all the ingredients and chop them down to 1 cm sizes or small enough to fit into your blender. 2. Add the ingredients in batches to the blender using the oil and lemon as the liquid so that the ingredients are not too dry and can blend well. 3. In a deep heavy saucepan heat up 2 tablespoons of cooking oil. 4. Add the blended liquid to the hot oil and cook slowly on medium heat until all of the liquid is cooked out and the mixture is cooking in oil alone. 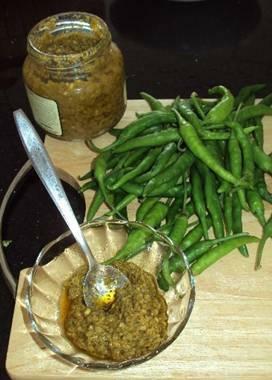 The mixture will have turned from a bright green colour to a yellowish green cooked colour and will resemble a thick paste. 5. Pack in sterilised glass or plastic jars and make sure to keep a half centimetre layer of oil on top of the mixture at all times. For preserving over 6 months, pack in glass jars and sterilise by immersing the jars carefully into boiling water for 15 minutes. Tomatoes seem to be the most common vegetable/fruit turned into sauces. Most tomato sauces in the market do not have any real tomato in their ingredients and are made from food colouring, flavouring and thickners. However, real tomato sauces are now becoming a convenient cooking product used across many cultures. The base of the recipe is generally the same and the final product can be changed slightly to suit different meals, cultures and recipes with an addition of fresh herbs, spices and even meats. 2. 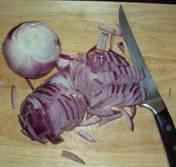 Chop onions and garlic fairly small and uniform in size and cook in saucepan with oil until almost fully cooked. Add salt. 3. Add tomatoes and black pepper and cook for approximately 30 min on a gentle boil until much of the tomato juice water has evaporated and mixture is quite thick mainly cooking in oil. Add a little oil if seen necessary.